It was not all that long ago—just a few years, as hard as that it is to believe—that Europe appeared to be the part of the world most closely resembling the end-of-history idyll  depicted by Francis Fukuyama  at the end of the Cold War. Democracy, prosperity and peace all seemed firmly entrenched. Not anymore. Parts of Paris are literally burning. The United Kingdom is consumed and divided by Brexit. Italy is led by an unwieldy left–right coalition that is resisting EU budget rules. Germany is contending with a political realignment and in the early phases of a transition to a new leader. Hungary and Poland have embraced the illiberalism seen across much of the world. Spain is confronting Catalan nationalism. And Russia is committing new acts of aggression against Ukraine. In what by historical standards constitutes an instant, the future of democracy, prosperity and peace in Europe has become uncertain. Much of what had been widely assumed to be settled is not. NATO’s rapid demobilisation after the Cold War looks premature and precipitous. There is no single explanation for these developments. What we are seeing in France is populism of the left, the result of people having difficulty making ends meet and rejecting new taxes, whatever the justification for them. This is different from what has fuelled the rise of the far right across Europe: cultural defensiveness amid local and global challenges, above all immigration. The European Union, for its part, has gradually lost its hold on the public imagination. It has been too remote, too bureaucratic and too elite-driven for too long. Meanwhile, renewed Russian aggression may simply reflect President Vladimir Putin’s judgement that, having realised large political returns on his previous military ‘investments’ in Ukraine and Syria, he had little to fear or lose from further actions. Likewise, opening Germany’s borders to a flood of refugees, however pure Chancellor Angela Merkel’s motives, was sure to trigger a backlash. 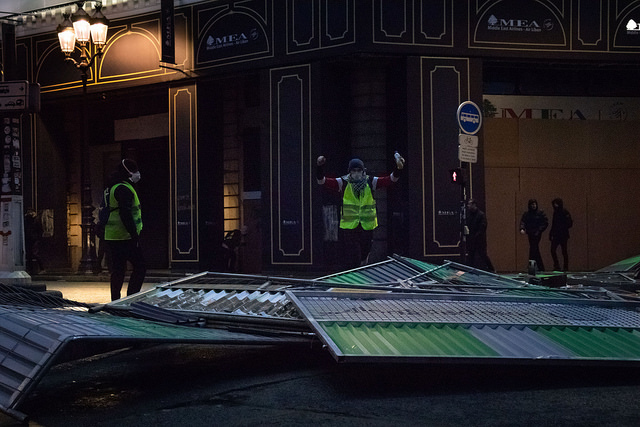 Most recently, French president Emmanuel Macron did himself no favours by backing down to the ‘yellow vest’ protesters and offering compromises that are likely to fuel additional demonstrations and exacerbate his country’s budget predicament. We should not assume things will get better. It is only a matter of time before France’s far-right National Rally (formerly the National Front) and political parties across Europe figure out how to combine economic and cultural populism and threaten the post–World War II political order. Italy’s hybrid populist government is a version of just that. But just as there is no single cause that explains Europe’s increasing disarray, there is no single solution either. To be precise, there is no solution of any sort. There is, however, a set of policies that, if adopted, would help leaders manage the challenges. A comprehensive immigration strategy that balances security, human rights and economic competitiveness is one such policy. A defence effort that focuses more on how money is spent than on how much is needed would go a considerable way in buttressing Europe’s security. Moreover, deterrence should be strengthened by bolstering NATO and further arming Ukraine. Weaning Europe from Russian natural gas makes sense as well, which implies halting the Nord Stream II pipeline that is meant to bring gas directly from Russia to Germany, bypassing Ukraine. And additional retraining programs are needed for workers whose jobs will disappear as a result of globalisation and automation. Alas, such an approach is unlikely to be forthcoming from Donald Trump anytime soon. That leaves Europe with no choice but to confront its disarray mostly on its own. Richard N. Haass is president of the Council on Foreign Relations and author of A world in disarray. This article is presented in partnership with Project Syndicate © 2018. Image courtesy of Olivier Ortelpa on Flickr.